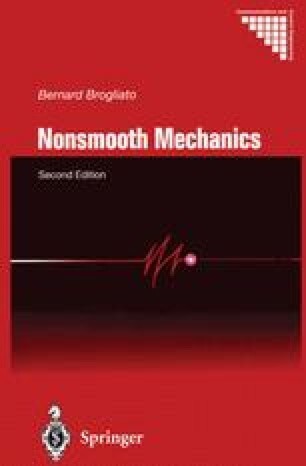 This chapter is devoted to introducing the mathematical basis on which nonsmooth impact dynamics rely. Impulsive shock dynamics are first presented without mentioning constraints. Then unilateral constraints are presented without speaking of contact forces. Emphasis is put on measure differential equations (MDEs), and on the difference between several types of MDEs and those which represent the dynamics of mechanical systems with unilateral constraints. Variable changes that allow one to transform such MDEs into Carathéodory ordinary differential equations (ODEs) or Filipov’s discontinuous ODEs are presented.